Powerful and wealthy people are invested in the idea of constructing climate change as a fiction, projecting the idea that scientists are folk story tellers, inventing tales that don’t stem from observation. Constructing climate change as a fiction allows us to pretend that we don’t need to change anything about our behaviour, to believe that we can allow things to go on as they are without repercussions. 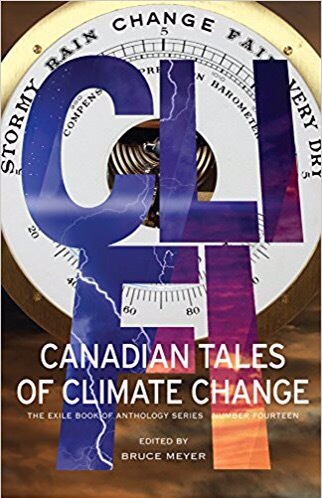 Cli Fi: Canadian Tales of Climate Change uses the power of stories to shift the dialogue, to give us possible glimpses into futures that we are creating through our own inaction. Cli Fi like most speculative fiction, is ultimately about the present rather than the future climate issues it presents. This collection reveals the way that we centre human experiences while ignoring the rest of our world, the way that we ignore our problems in order to push them onto the future. As much as being a set of stories, Cli Fi is a call to change, a call to transform ourselves the way our fiction transforms our way of thinking about the world. The anthology begins with tales from the perspective of aged protagonists, something that is rare in a society that doesn’t value aged bodies, and yet, the collection prefaces these bodies, positioning them as ones that have witnessed long term changes, long term development. Youth frequently don’t see changes as shockingly because everything is new and because they don’t have years of observation to back their ideas upon. When they see a news report that says that we are experiencing record temperature highs or record temperature lows, they are comforted when the news refers to these temperatures being reached at another time this century. But, they may miss the fact that the last few years have been ones where more records are being established, and where these records are being met or exceeded more often and in closer proximity. Whereas aged people can make observations about the longue duree, making observations over a longer period of time. I shouldn’t suggest that by having ageing bodies at the outset, that this anthology is all about ageing. In fact, there are a wide variety of ages portrayed to add the perspective of the way that climate changes affect us as we age. Cli Fi provides stories that look at how the environment interweaves with our bodily experiences and existence, the way that we both shape and are shaped by our ecology, altered by and altering our world. These stories remind us that we are participants in creating the world that we want. This is not a utopian collection. The stories in these pages invite us to ask some hard questions, and it is hard to read the collection in one sitting, but that time to pause is necessary. It invites us to ponder for long periods between stories, looking deeper into the tales and what they mean for us as people. The authors remind us of our connection to the world around us, pointing out that water makes up most of our bodies, just as it makes up most of our surface world, and water runs through these narratives as much as the ink runs onto paper. It binds us to our environments, a flowing story that speaks of history and change, but also of the danger of contamination and the vulnerability of our world to our pollution. This is not just an anthology ABOUT climate change, it is one that invites us into the process of changing our climate. Cli Fi invites us to ask critical questions about the world around us and our relationship to that world, to interrogate the messages we receive from our environment and open critical dialogue about it. Cli Fi is an invitation to do no less than change our world. Although primarily speculative fiction, this collection opens up real world possibilities. Story examines the strangeness of Newfoundland – its ability to represent so many unique geological features in one island and the potential of the landscape to imprint itself on our memories and our bodies. She explores the possibility of a psycho-geographic effect, a strange link between people and the landscapes that they occupy, each reflecting each other. Story examines the complexity of ideas of home by exploring a space other than the house, but rather the way that a larger environment imprints on us. We often think about our landscapes in terms of human change, but rarely examine the way that we are, in turn, shaped by our spaces of home, the landscapes that we occupy. Sean Virgo’s “My Atlantis” is a tale about the return to a changed land. Like Rati Mehrotra’s tale in Cli Fi, this tale features an older person, but unlike Mehrotra’s tale, where the protagonist is stationary in a changing land, this aged character is returning to a place that has become his touchstone over the years, associated with memory, and able to remind him who he is. The problem is that his touchstone has changed, deteriorated by the impact of environmental destruction. Although wildlife is returning to this landscape as human beings move into the cities, that wildlife is struggling to stay healthy and survive in the damaged environment that remains. The protagonist works in mental health and frequently works with people who are experiencing memory loss, and that notion of memory is a significant one in this narrative as it shifts through different periods of time while memories arise one after the next inspired by glimpses of familiar scenes altered by time and the human desire to change our environment. Age is a significant factor in this tale as the protagonist is able to draw on a lifetime of memories of a place to reflect on its changes and highlight the way that the world has shifted. North American society is relatively short sighted about our impact on the environment, so it is significant that Virgo chooses a long duree approach to the environment, observing it over the course of a lifetime to see the impact of change. In this episode of Speculating Canada on Trent Radio, I interview the wonderful Marie Bilodeau about her new series Nigh, a series about the Fairiepocalpse. In our conversation, Marie and I discuss the power of myths and legends about fairies, the relationship between the natural world and human occupation, the power of unsettling norms and expectations, and the nature of apocalyptic narratives. Marie recognises the magic of the apocalyptic and the idea of The End as a place of speculation.